Hope and heartache go together like ketchup and mustard, tacos and tequila, or chocolate and peanut butter. Hope and heartache follow one through most, if not all stages of life. For me in the past year, I have seen far more heartaches than I should have but somehow found hope in the midst of the chaos. One afternoon, after having an off morning, I grabbed some coffee with a friend. Not a planned event, just an opportunity that came about. A little coffee, some giggles and then a blog post. That’s right a blog post was like a shot of caramel in my coffee. Sometimes I get the itch to write or type at inopportune times, but I flex to get it done. My inspiration is normally whimsical to an extent but my content is normally heartfelt and full of hope at the root or the end of the story. A signature of sorts for this Chick. And with that I decided to blog about hope and heartache. Mainly because some like to read the good stuff. The juicy gossip. The tall tales or even the sweat stories I write. Today’s post is a little different. It’s somewhat about life’s turbulent times. Life lessons. Speed bumps. Hurdles. We all have different versions of life’s blah moments. It’s a choice for me. I choose to find hope instead of dwelling on the heartache of negative situations. It works for me. I like to reframe and bend and flex with life’s ups and downs. The past few months, my life has definitely had some curve balls and some struggles. Through the days I followed my heart, I settled my mind, and I focused on the hope of a new day or a new beginning. A restart button of sorts. Only time could allow this to happen and no specified time was known. For me that is like tackling the impossible. Not knowing the end game. Not knowing what’s next. Not knowing how long or how much. Another person close to me was in the same situation. Not knowing what’s next. We can call them growing pains. Not knowing how to hit the restart button. They needed time to sort through the weeds to find the wisdom. The path. The path less traveled because it’s not an easy path. As the days turned into weeks and weeks turned into months, hope faded. Hope didn’t disappear, it faded. It took strength to endure the unknown in one area but that same fading allowed for sunshine to illuminate a path not visible to others. You see, sometimes giving up control to gain control is what is most needed in challenging life situations. We can’t control or anticipate everything but we can control our emotions. How we react to uncomfortable situations, challenging people, and negativity. We choose each day to be happy and see hope or dwell on heartache and anger. What do you choose daily? Trust me, some days are harder than others. Some days I need a friend to take my volume down a notch and other days I need to practice my patience muscles. Part of my mind balance is to stay fit. Keeping my body and mind stimulated is a must in my weekly routine. With my mind balance, I choose daily to be around people and environments that not only challenge me but inspire me. I reduce the negatives and walk away from individuals who wear anger and heartache on their chest daily. I seek out those who need a pick-me-up. I seek the isolated individual who may have faded hope. I aim to help them see hope through their eyes. As I write this post today it is my hope that somebody reading this can feel hopeful in whatever circumstance may be challenging them at the moment. Everyone has a battle of some sort in front of them. Most won’t see it daily. Until next time, choose happy. Offer hope. Make a difference. Challenge Myself to be Last! So this morning my workout buddy “JB” challenged me to be last. What does that mean? I strive to be first (or top five at least) every time out of the gate even if it’s not really attainable. I have the top of the pack mindset in most every task I take on. He said push yourself! If you are finishing too quickly every time you are not pushing yourself. Challenge yourself to be last all of 2019. More weight. Harder movements. No sandbagging. Challenge accepted, my friend. No excuses. Put up or shut up. Enough said. I’m a take action kind of girl so I will accept the task at hand. In return expect to hear the Mouth of the South pushing you back. Out of affection, of course. Anyone else want to finish last with me? It’s the new first place because I’m challenging myself to go harder. Short but sweet Monday motivation for you! Everyone needs a JB in their life to notice when you are coasting. Complacency can get the best of anyone at anytime. It will sneak up on you. But guess what? If you have a good support system around you, personally and professionally, you will be one of the few who keeps forging ahead. When you find the JB in your life, cherish it. Embrace the uncomfortable feeling that person gives you. Then pass it on. If you are lucky enough to have the person to push you, push another. Maybe not off the ledge, but give a motivational push. Today. Tomorrow. And the next day. That person may hear you but not react on the first occasion. It may take more than once. It may even take 6-12 months. Trust me I know somebody in that category who is slaying it today and passing on the motivation now but never really saw themselves as having that power. Everyone has the power to positively impact others. It’s Monday peeps. Slay all day. If you’ve been reading our blog for a while, you know the 2 Chicks have been through some pretty big changes this year. Physically, professionally, personally, you name it, we changed it. To celebrate these changes and continue creating our big vision for 2019, we recently met for a photo shoot. Here’s a glimpse! As usual, we got to laughing pretty quickly. 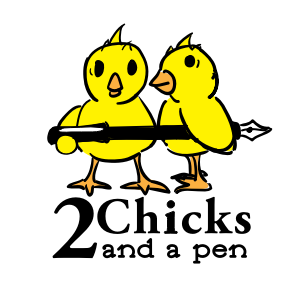 Yup, that’s a glimpse of just a few of the faces of 2 Chicks and a Pen. Every day is an adventure. Some days are giggles, some days eye rolls, some days who are you? We just wonder. Anyway, big things are coming in 2019 for these 2 Chicks. Our next chapter will be an exciting one! Keep following us here, on Instagram, and facebook for all the latest updates. This holiday season has looked a bit different than years past and different than I planned in my mind, but peaceful all at the same time. This month I spent time on gratitude. I wrote hand written notes to those who made an impact on me. I shared some sweet Starbucks treats as an added bonus and it made me feel so happy to see the smiles for those who didn’t know they were coming. I received as well. I met some girlfriends for an annual exchange event. It was a blast and I received some treasured keepsakes. A pickle ornament. Random but special. A notebook. A super secret notebook to pencil my ideas and visions. A bracelet. An intention bracelet that reminds me to love others unconditionally. Stickers. Seems simple enough but they were motivating stickers. Power stickers to use as momentary reminders to take action. The infamous tank top. A bold statement given on a shirt to see if I have the brass to wear it in public. The answer is yes! My gal pals know me so well. They are also part of my inspiration. I continue to evolve as they support my goals and dreams. I made my annual donations at Goodwill, coats to the homeless, books to kids and made some other charitable donations to warm my soul. Giving will always be part of my holiday season. I spent some time rekindling with family and friends near and far. Sometimes when you only have the ability to make a call it’s still is better than no call at all. Technology offers the flexibility of FaceTime or Skype as well. I cleared some clutter on the home front. Shifted some furniture and mindsets. I made some shifts personally and professionally to be aligned for the new year and all the crazy that 2019 has waiting for me. Put up a new vision board to help focus on moving forward with vim and vigor. As part of this process I took some time to invest in myself as well. Nothing major, just aligning of key resources to support what’s ahead. In order to be a strong leader, one must take slivers of time when they present themselves as opportunities to recharge your batteries. This could be in the form of pampering, it could be in the form of extra rest, some time alone, some time thinking, or maybe even a shopping spree. I won’t tell all my secrets here but I will stress the importance of self care. Self care is often overlooked and can cause stress for some. I also emphasize the ability to give up control to gain control. Sometimes you battle so hard without seeing results, requiring you to let go in order forge ahead. This could be translated to business, personal or even relationships. Letting go can be hard but can be a necessity to reach the ultimate outcome you want or need. The above leads me to risk. Every day one is faced with risk taking. Some take a cautious approach while others stare it down with optimism. I look at risk with ambition and optimism. I trust the process. I look ahead knowing what the worst could be, but smile at the thought of what can be. As 2019 approaches for you, be fearless. Connect or reconnect with a loved one. Try something new that you have been putting off for whatever reason. Step out of your comfort zone and invest in YOU. The power of YOU is something you control! I leave you with one of my cards from a vision board I use. It may help with any ups and downs you face in 2019. It’s a phrase we hear often…someone who “goes the extra mile.” But what does it really mean? I’ve been thinking a lot about that phrase for the past few days. I went to the gym on the day after Thanksgiving. There wasn’t a workout at the times I could make it. So, I took advantage of the open gym and walked in between classes. My goal was 10,000 meters. My legs were screaming sore after a long Thanksgiving Day workout so I started by hopping on the bike erg and did a pretty quick 5,000 meters. Then, moved over to the rower for a somewhat slower 3,000 meters. Finally, I faced down the dreaded ski erg and did 2,000 meters, split in half. (Ski is much more challenging for me!) I had stretched in between, so I was feeling pretty good and sweaty by this point. I had a few minutes left before I had reached my hour-at-the-gym benchmark, but I had already met my 10,000 meter goal. What to do? And on that, I just decided to do skip meters and do a mile. And as I rode, I got to thinking about the extra mile…which is what brings me to this post. To go the extra mile is to go beyond what is required. What is expected. The minimum. As my kids say (or used to say, since once I understand this kind of thing it is definitely past its moment) you can be basic or you can be extra…regular or over the top, I guess. There are areas of life where I want to work harder to go the extra mile. Friendship. Family. Fitness / Nutrition. Those are probably the big three for me right now. Ones I want to work on. How can I go the extra mile? -Remember to get all the things my family needs as I shop / do errands, etc. I am not going to lie. There are many areas of life where I am struggling to meet basic expectations. But, at the same time, I feel a deep level of fulfillment when I exceed what I and others expect of me. Over the next day or two I’ll be planning and making moves to get these things in motion. Even just this list with a daily checkoff can be a step toward accountability and progress. So, readers, how are YOU going to go the extra mile in the next month or two? How can you extend kindness, comfort, or even badassness to make your life and the lives of those around you a little more over-the-top-amazing? Tell us in the comments. Here’s a glimpse of the sunrise that surprised me mid workout that morning, a brief break in a week of dreary rain. Be the unexpected, the surprising light for others and yourself.